October 19th is National Chocolate Cupcake Day! Have I mentioned how much I love these crazy random holidays? Because I really really love them. Also have I mentioned how much I love chocolate or sugar or cupcakes or well anything not good for you? So my coworker’s birthday is today and he loves chocolate and peanut butter. He actually eats peanut butter almost every single day. 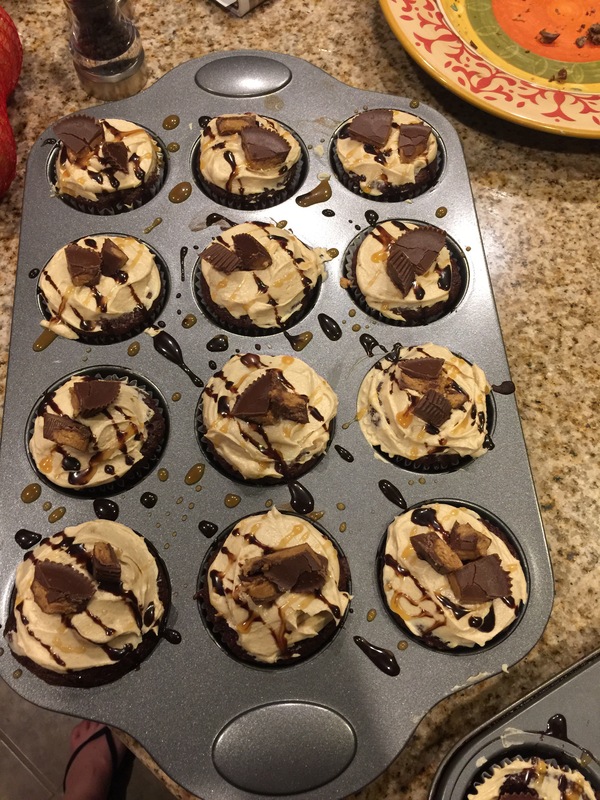 Thus the perfect timing to come up with a chocolate peanut butter cupcake! For those of you who have been following me on snapchat you know that I’ve been trying to eat healthier and work out more yada yada. I have a feeling these cupcakes may set me back a bit lol. I guess I’ll just have to go to the gym an extra day because you can’t not eat these things. Cupcakes: Preheat oven to 350 degrees F. Line 2 muffin tins with cupcake liners. Prepare box mix and fill each liner ½ of the way full. Place a Reese’s cup into the center of the batter in each cup a lightly press down. Bake cupcakes for 16-20 minutes or until done. Icing: Beat butter and peanut butter until smooth. Slowly add powdered sugar beating continuously. Once well blended add vanilla and cream. If your particular on your frosting consistency you can add a tablespoon at a time until it feels right to you. Or can dump it all in and fix it later lol. If you want you frosting thicker add more powdered sugar; oooooor if it is too thick add more cream or even milk. Make sure your cupcakes are completely cooled before icing them. You can use an icing piper or just fill up a ziplock and cut a corner off. I drizzled chocolate and caramel syrup on top of my icing. Then chopped up the remaining Reese’s and sprinkled them on top of that. Because you know there wasn’t enough sugar or chocolate or anything like that in there already. A chocolatey peanut buttery overload of deliciousness. I hope y’all enjoy this choconutaliscious cupcake. Follow me at The Girl and the Coconut for more tasty recipes and some great travel ideas. Also check me out on Snapchat and Instagram for pictures and events around town.